The Catalan regional political movement known as Junts per Catalunya (JxCAT, Together for Catalonia), is an electoral platform formed in November 2017 and focused on the re-election of former Catalan President Carles Puigdemont in the region’s 21st December 2017 elections. JxCAT is not synomymous with Puigdemont’s own PDeCAT party (Partit Demòcrata Europeu Català, Catalan European Democratic Party), but was created for the 2017 elections to field a broad-based parliamentary list of candidates known as the Llista del President (President’s List), who were hand-picked by Puigdemont from among PDeCat members and independents loyal to the former president. 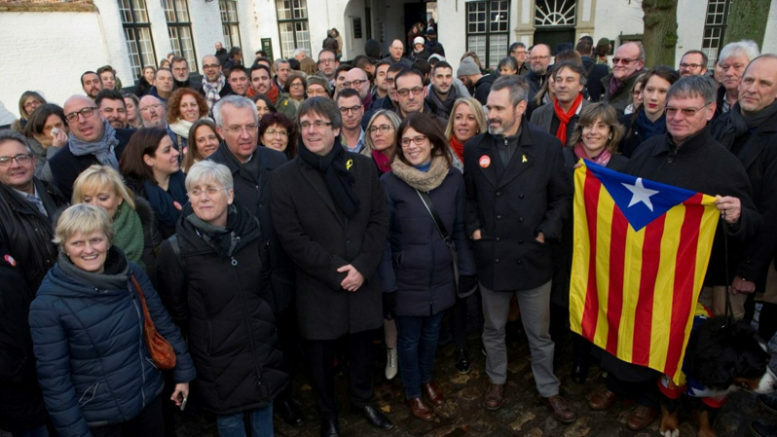 The movement’s strategy was to attain the largest number of votes among pro-independence voters in the 21st December elections, thereby re-vindicating Puigdemont’s claim to be the president legítim (legitimate president) of Catalonia, following the imposition of direct rule of the region by the central government in Madrid under the terms of Article 155 of the Spanish Constitution, triggered by a vote of Spain’s Senate on 27 October. Prior to formation of JxCAT and the list of candidates led by Puigdemont, in early November the former president fled Spain for Brussels to avoid arrest when he failed to appear for a court hearing on charges of rebellion, sedition and misuse of public funds. The charges, for which Puigdemont is still wanted in Spain, are related to Catalonia’s 1st October 2017 independence referendum and subsequent declaration of independence by the Catalan Parlament, in defiance of warnings from Spain’s Constitutional Court that both actions were in illegal under the terms of the country’s 1978 Constitution. In the 21st December regional elections, the JxCAT list won 948,233 votes for 21.7 percent of all ballots cast, making it the second-most voted political force behind the centre-right Ciudadanos party. The results also showed JxCAT to have received more votes than other pro-independence parties fielding candidates in the election and gave it 34 of a total 135 seats in the Catalan parliament. After the elections, JxCAT began lengthy negotiations with pro-independence forces in the parliament. After a refusal of Spain’s Supreme Court to allow Puigdemont to sidestep a judicial hearing and certain arrest in order to personally present his candidacy in Parlament as required by law, on 3rd March Puigdemont withdrew his candidacy in favor of pro-independence activist Jordi Sánchez, currently in preventive custody in a jail outside Madrid awaiting trial on the same charges of rebellion, sedition and misuse of public funds for which Puigdemont is wanted in Spain.